Today University Avenue finally has a bike lane and it's a vast improvement over what used to (not) be there. 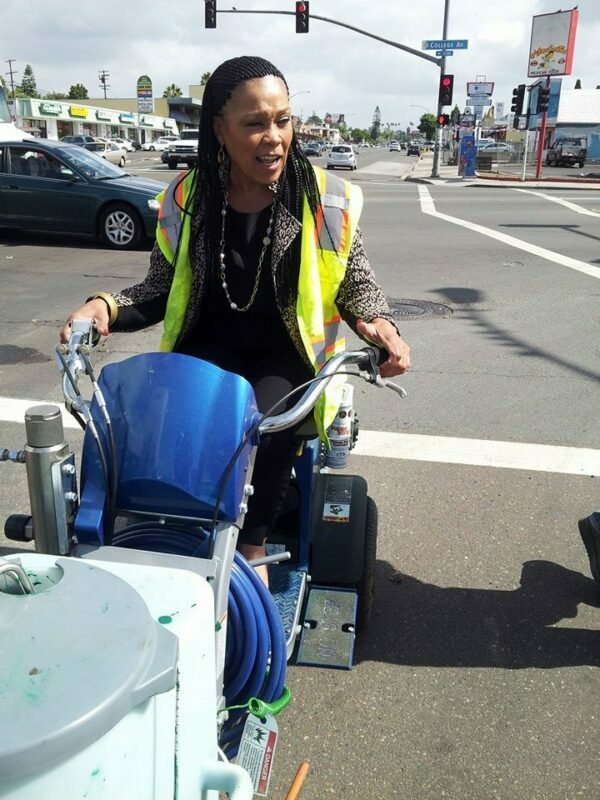 Thank you Councilmember Cole! In light of the first successful Open Streets event in San Diego and the current plans to have the next one connecting the beach communities next Spring, we thought we'd introduce you to the man behind all the magic that made CicloSDias a reality, Ed Clancy. 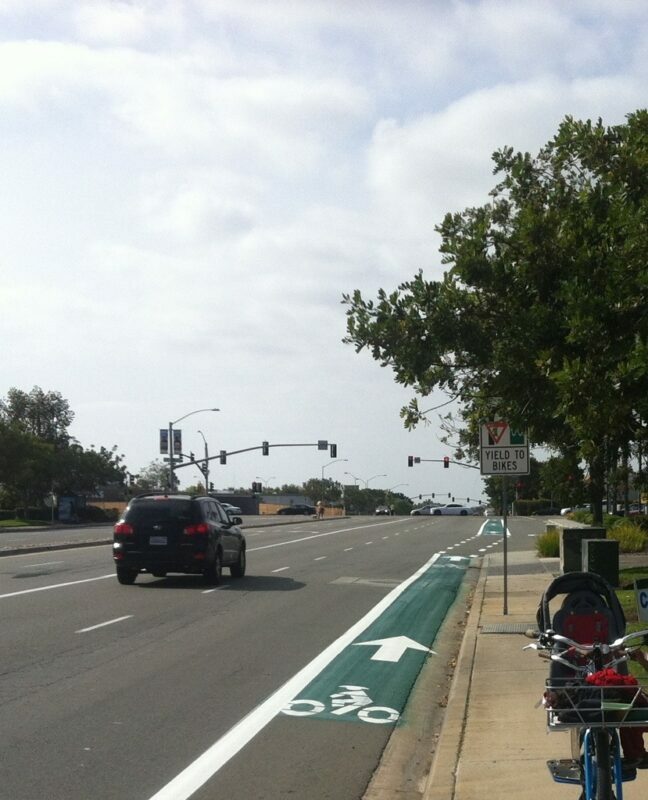 BikeSD:How long have you been in San Diego and what brought you here? Clancy: A little over two years. There was an opportunity to do community outreach and work with advocacy groups during the last election cycle. BikeSD: How did you become the Program Manager of Bicycle Initiatives in the City of San Diego? As a new position, what was the intention behind creating it? Clancy: Mayor Filner and the City Council has a vision for bringing up the quality of life and livability of our City, and her residents. The position was vacant during the last administration – nearly seven years, while many groups, like yours, had been formed to join in the chorus of making our neighborhoods more bike and walk friendly. 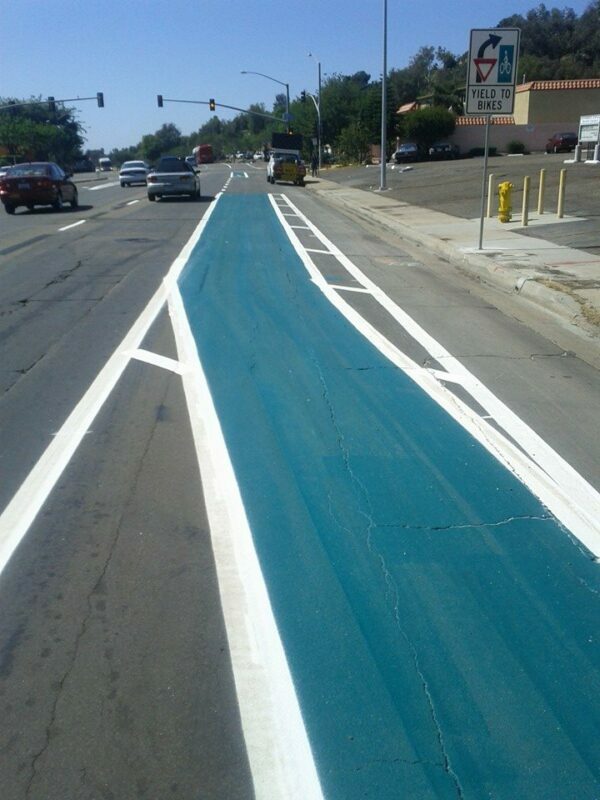 BikeSD: How do you envision San Diego becoming a world class city of bicycling? What do you see are some of the hurdles that need to be overcome in order for us to get there? Clancy: The many neighborhood groups that have been championing safe streets, safe routes to schools and policies to support the growing interest for connecting bike routes in all directions; to work with county supervisors, legislatures, and regional municipalities, for funding, to address infrastructure needs; and to look at the positive ways cars and cyclists can co-exist. 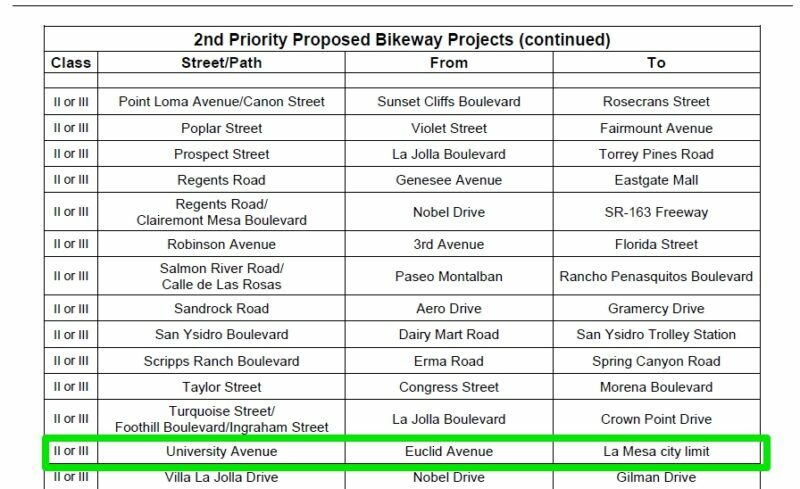 Those are a few examples of working on projects from the ground up to the high-profile as evidence that San Diego can be a world class city for cycling. The only challenges are our limits on working progressively. 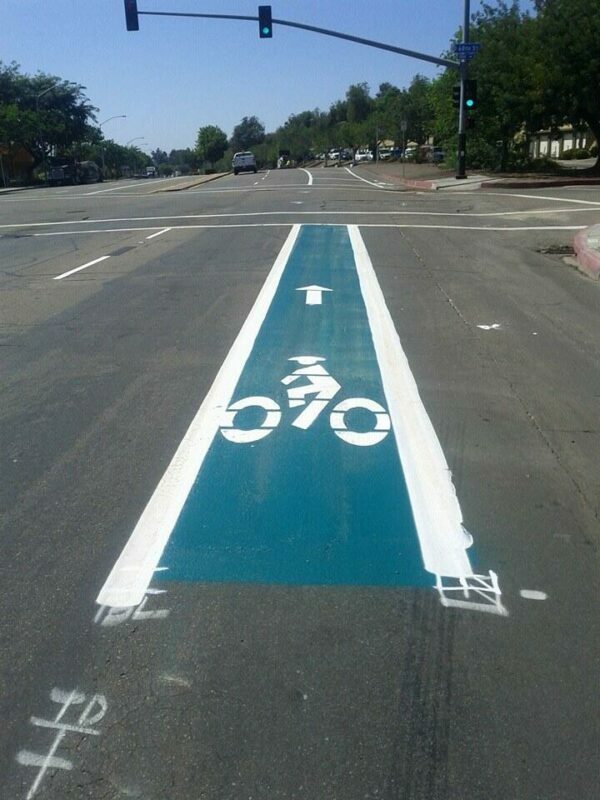 Also, during Bike Month (May) we were able to highlight six areas of green bike lanes at conflict zones/intersections to bring attention to cyclists on the streets and remind cyclists of cars intersecting. More of this is being worked on now. BikeSD: What has been the most exciting aspect of being in this position? 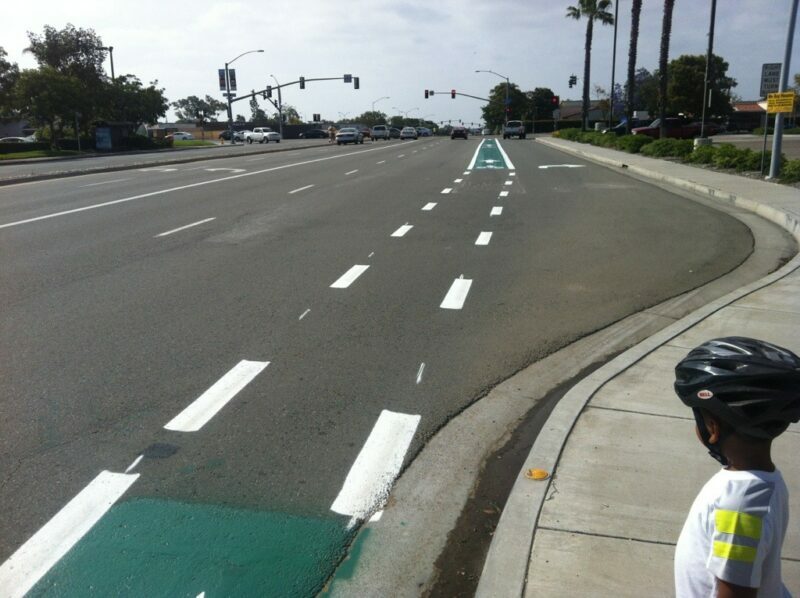 BikeSD: You helped ensure that the public have a way to communicate the issues they deal with as bicyclists by creating the Livable Streets Advisory Committee. What role does this Committee serve and what are some of the issues that are being dealt with that are exciting, what are some of the challenging issues? Clancy: The committee is to ensure transparency in discussion and recommend direction on policies that will add to our quality of life, and include a vision, as mentioned. 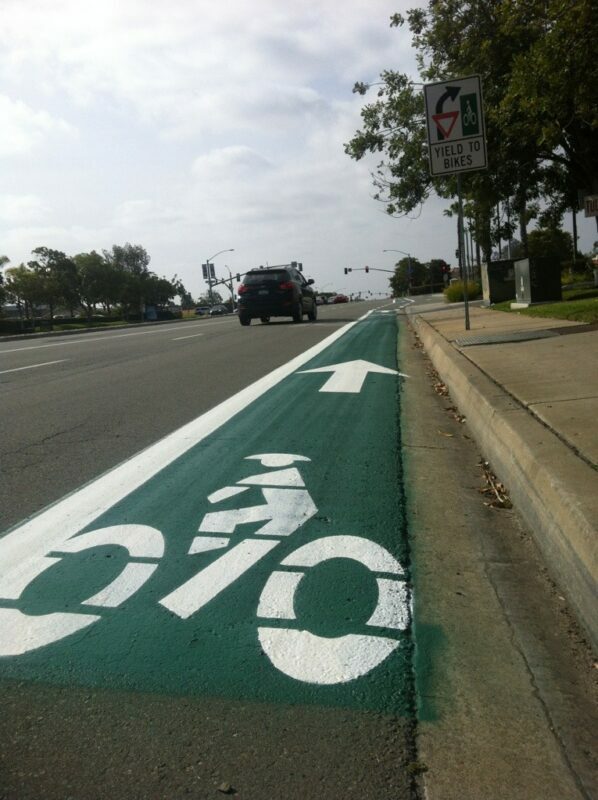 It is also strongly suggested by the League of American Bicyclists to show wide spread engagement. The challenge is that the committee keeps growing…which is good! Public Service are represented (Lifeguards, Police, Fire), City employees, community business leaders, and advocates, including everyday working citizens who enjoy biking, walking, outdoor activities. We’ve recently identified a sub-committee who will work specifically on complete streets policy/definitions, drafting a proposed policy with considerations for a complete streets ordinance. BikeSD: What has kept you busiest since you became the Program Manager of Bicycle Initiatives? Clancy: Organizing and coordinating CicloSDias, and it’s many moving parts, certainly takes up a lot of time…A close second has been working with Transportation engineers on increased applications for bike lanes; ramping up initiatives like bike share initiating a City employee bike use program (ride to lunch! ), are all part of a day’s work. Clancy: They are great. Brian has tremendous knowledge on Engineering principles; Tom loves to bike, has a great work ethic and commitment to make a difference. BikeSD: How can our members and supporters support your efforts at the city and make your role truly rewarding? Clancy: We can continue to work together in identifying community needs and how the City can be of greater service. BikeSD: What sorts of riding do you? Clancy: I am a roadie…and will ride anywhere. Now, I’m lucky to commute two days a week (25 miles round trip) though need to get this up to five days. This fall I’m participating in challenged athletes foundation ride from San Francisco to San Diego. Our City also offers from scenic to challenging elevation rides. You also have a great monthly ride to the border I need to join, as well as Nicole Burgess’ Bike train to school in OB. One dream ride would be across country. BikeSD: What type of riding truly satisfies your soul? Why do you think that? Clancy: I like the charity rides that are multiple days, they are hard (averaging 80 miles a day) but the reward is bigger than oneself. Thank you, Ed, for taking the time to not only share your perspective but also put on the city's first open streets that got no traction until you stepped in. 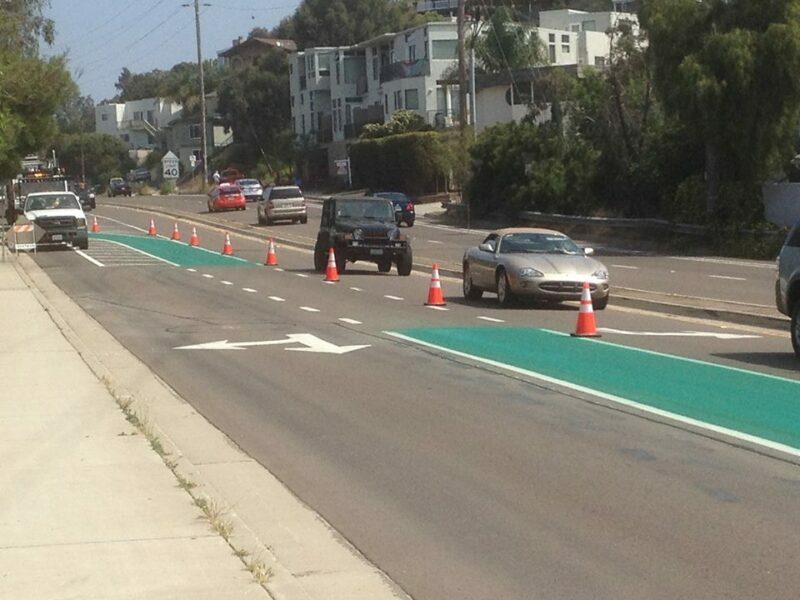 Have you ridden on any of the green bike lanes in San Diego? What are your initial impressions? 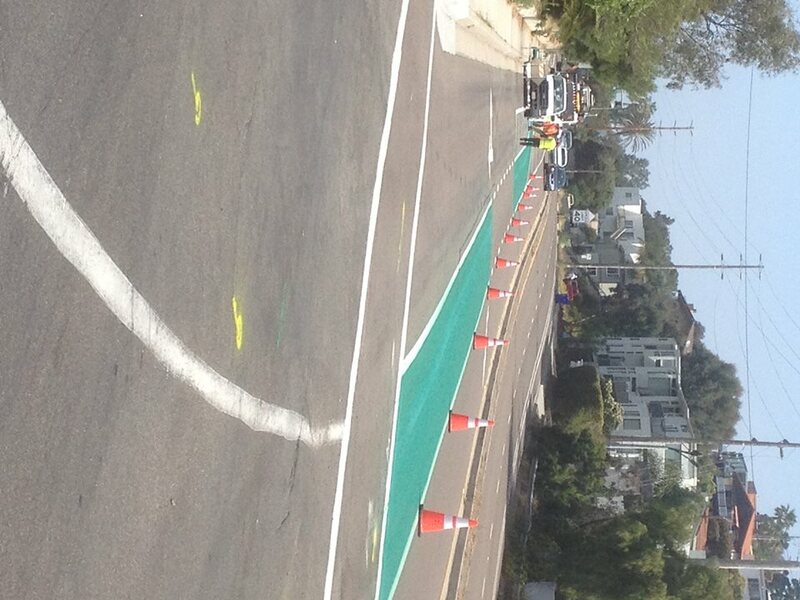 The southbound Genessee Ave bike lane was painted green in the "conflict zone" just before intersecting with Balboa Ave. 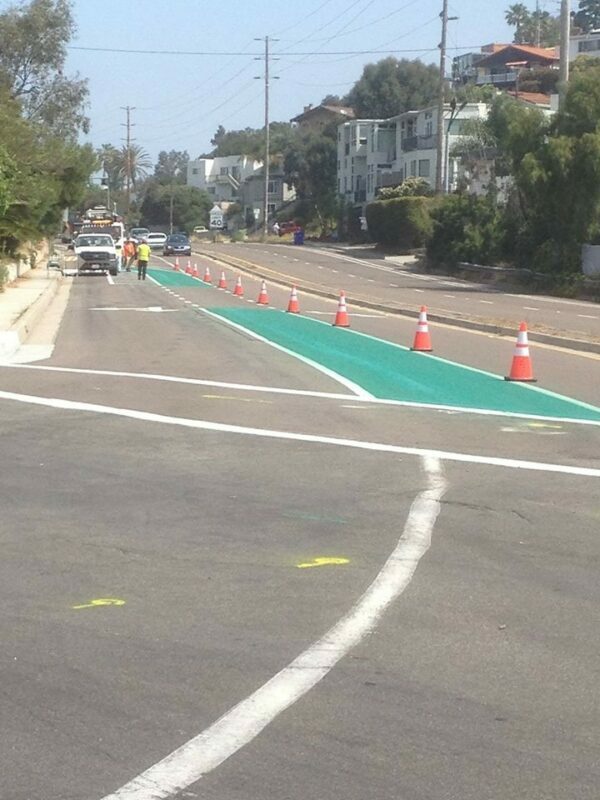 This is the fourth green paint treatment to be installed by the city in the past two weeks. One more intersection will get this treatment: Palm Ave and Dennery Rd. 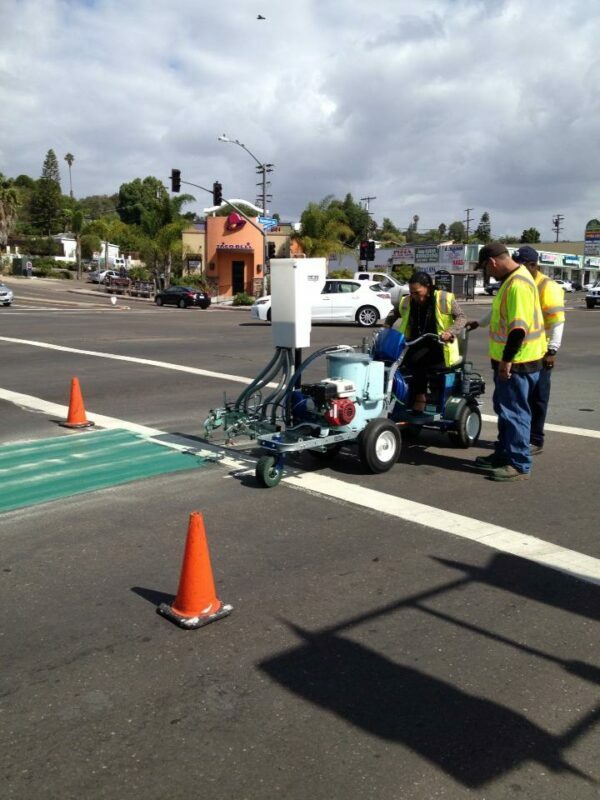 Look for more green paint on Balboa Ave in the coming months from a project being spearheaded by Councilmember Lorie Zapf. If you've had a chance to ride the new lanes, what did you think?